Sift all the dry ingredients together (flour, sugar, cocoa, baking soda, baking powder, salt). Mix the buttermilk, oil, eggs & vanilla. Use the paddle attachment when using an electric mixer. Mix on low speed until all ingredients are combined. Then stir in freshly brewed hot coffee to the batter and stir just enough to combine all the ingredients making sure to scrape the bowl with a rubber spatula. Bake: Pour batter into two 8 inch round prepared (butter & flour) cake pans. Bake at 350 degrees F for 35 to 40 minutes until toothpick is clean with a few moist crumbs (don’t over bake). Cool completely before adding frosting or filling. Cooling will help get the cake out of the pans. If they don’t come out easy, use a rubber spatula to help it along. Ease the spatula completely around the cake while pushing it slightly under the cake at the same time. It should come out in one big beautiful piece. 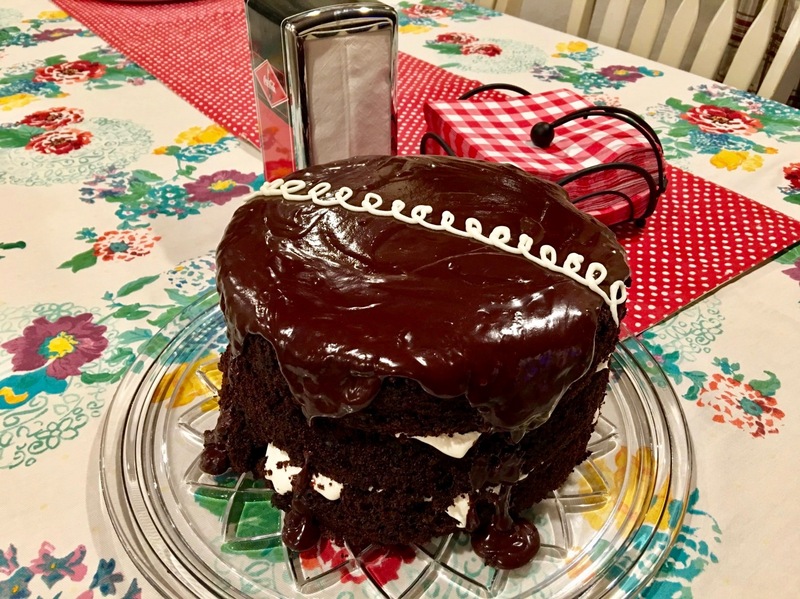 Note: The cake in the photo is 3 layers and this recipe is for 2 layers, so increase ingredients by half again as much for a 3 layer cake, and double the recipe for 4 layers. Directions: Using a mixer, cream the butter until fluffy. Gradually beat in confectioners sugar, then add almond extract until mixed. Last, fold the marshmallow creme into the frosting until completely combined. Note: Double this recipe for the 3 layer cake in the photo. Each layer of this cake took the whole marshmallow recipe above. Directions: Heat cream and butter until just starts to boil. Turn off heat and stir in chocolate and vanilla. Whisk until smooth. Let stand until cool but still glossy and liquid. Pour over cake, gently pushing frosting to edges. Ideally refrigerate for a couple hours, then add squiggle icing on top. Mix butter until fluffy, add sugar gradually until mixed. Add vanilla and milk until all ingredients are mixed. Use a small round piping tip to make the squiggles on top. Raving reviews from family and friends on this cake. Enjoy!